Alex Reese - 6'9 - 238 lbs - Sophomore - While his role was limited last season, when Alex did get playing time I thought he responded well. As a stretch four, he could obviously shoot the ball, but he was a better rebounder than I anticipated. Other strengths: good hands, great outlet passer, good basketball IQ, played with confidence. I think there's a greater role for Alex to play at some point, but I can't help but wonder, with so many guys back this season, will he get the necessary minutes needed to expand his role? His freshman numbers: 4.0 ppg, 2.8 rpg, 11.6 minutes per game. Daniel Giddens - 6'11 - 247 lbs - Junior - It was a mixed bag for Daniel in his first season back on the court after sitting out a year. He showed himself capable of finishing strong at the rim, he had a solid hook shot on the offensive end, but he was not the force on the glass I was hoping he would be (only 2.5 rebounds per game). His biggest struggle was simply staying on the floor due to foul trouble. Needless to say, that must improve if Daniel is going to play a bigger role on this team. His 17-18 numbers: 4.2 ppg, 2.5 rpg, 1.0 bpg, 13.3 minutes per game. Javian Davis-Fleming - 6'9 - 268 lbs - Freshman - Javian was a 3-star prospect from the state of Mississippi in the 2018 class. 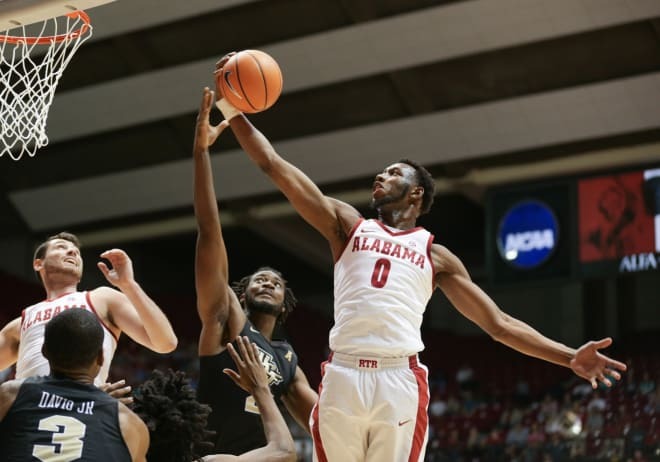 He's not an above-the-rim type of player like Donta, but he's a very skilled low post player that can score with his back to the basket or facing up (Avery recently said they could run offense through Javian at the elbow). He may need some time to develop, but I think he has the upside to be a very good college basketball player in the near future. Fortunately, Alabama has the necessary depth on the roster this season that will allow Javian to take things slowly. Tyler Barnes - 6'8 - 205 lbs - Sophomore - Tyler is a walk-on. He played in four games last season. Galin Smith - 6'9 - 245 lbs - Sophomore - Galin's progress from the beginning of his freshman season to the end was quite noticeable. He had a very limited role throughout the season, but in the final five games he averaged 5.8 ppg, 3.0 rpg, while averaging 18 minutes per game. The hope is that those final five games were a preview of what we'll see from Galin for the entire season in 18-19.